Peel and cut up the potatoes into small pieces. If using fresh green beans, cut off the tops and cut into pieces. Slice the onion. 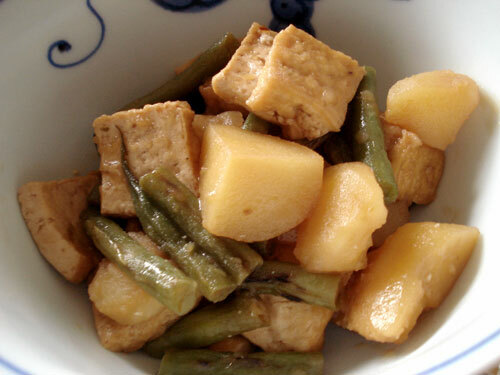 Cover the fried tofu in boiling water, and drain. This gets rid of much of the surface oil. Heat up a heavy-bottomed pan with the sesame oil. Add the onions and cook until translucent. Add the potato and tofu pieces, and sauté intil the oil coats the pieces well. Add the green beans and toss around some more. Add just enough water to cover. Add the sake, soy sauce and maple syrup. Bring to a boil, then lower the heat to about medium-low, put on a lid and let simmer until the potatoes are tender, about 10-15 minutes. To concentrate the flavors even more, take the lid off and simmer for an additional 10-15 minutes until the liquid is almost evaporated - this step is optional. Serve hot or cold. 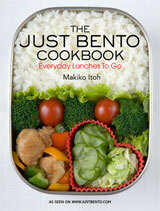 The flavors mellow if you let it rest, which makes it very good for bento. This is even better if you use new potatoes. If you compare this recipe to the classic nikujaga, the first thing you may notice is that there's no meat. There is also no dashi stock used. Traditional dashi stock, which forms the basis of the majority of savory Japanese cooking, is not vegan, since one of the key ingredients is dried bonito (fish) flakes or niboshi (dried little sardines). Using a vegan dashi which uses just kombu seaweed and/or dried shiitake is an option. But it's also possible in some cases to omit the dashi entirely, as in this recipe. When you omit meat and dashi (or any soup stock), what you lose is a lot of umami. To make up for this, add ingredients that are inherently rich in umami or other flavoring ingredients. In the recipe above for example, the onion, sake, sesame oil, soy sauce and maple syrup add plenty of flavor to the dish - and without dashi the flavor of the potatoes comes through better too. And about that maple syrup: Since Japanese recipes often call for sugar, using a flavorful sweetener instead of plain white sugar is a way to add some extra oomph. Raw cane sugar, brown sugar, palm sugar, maple syrup and honey are some options. Dark maple syrup goes very well with Japanese flavors. Submitted by maki on 2008-04-23 14:06. Hi, this recipe looks delicious. However, I can't get fried tofu where I live. So I was wondering if you had a recipe to make this fried tofu. I've tried to just put tofu in oil, but I find it wasn't really tasty, well not quite as tasty as fried tofu from Japanese restaurant. Also would it be the same procedure to make to tofu for the inari sushi? Atsuage (the thick kind) is fairly easy - just deep-fry a block of firm tofu that has been drained and patted dry, in oil at a fairly low-ish temperature, until golden brown. The keys are to use a fairly low temp, and to take your time. Once it is golden brown drain off the oil very well. Thin fried tofu (usuage or abarage) is a bit more difficult though...you can try slicing a block of tofu thinly, and frying the slices, but they often don't form that nice pocket inside from my trials (it's rather hit or miss). I guess they do something to the tofu slices in a factory to make them form that pocket. A meat-free version of nikujaga :) My mother is a vegetarian, but she really likes nikujaga. Here's one I can make for her. Question about the recipe though: if I use kombu stock + soy sauce and sake broth mixture, should I omit the maple syrup? Or will it give it good flavor? I'm kind of skeptical about the syrup in it xD Thanks! You do need some sweetness (the original nikujaga recipe has sugar in it). The maple syrup really fits because it adds some extra caramel-like flavors with the sweetness. Give it a try! I am trying to eat less meat these days. Made this recipe a few nights ago and loved it. I let the beans simmer right off in the beginning like you suggested and it soaked up the sauce. It was quite yummy. I wolfed down nearly the whole dish by myself. Am not a potato person, so omitted the potatoes in the recipe. you can use regular (do you mean light or Grade A syrup?) instead, though it won't be the same of course. You could even use sugar. can i change maple syrup with golden syrup???? it would taste a bit different, but sure you can. I had to replace the maple syrup with golden syrup, but it still was very delicious. The leftovers went into todays lunchbox. As I finally get around to the business of bringing lunch to work in 2009, I am scouring my favorite blogs for "winter" vegan recipes. Nikujaga looks awesome, but I have a rather deap-seated hatred of green beans. I know I'm too old for that excuse, but there it is! I was wondering: will carrots added at the last 5 minutes provide that same "crunch", or do you suggest cooking them along with the potatoes? Hi Laurie. You could add carrots at any time depending on how crunchy you want them. You can omit the green beans too. If you want a bit of color, you could sprinkle some chopped green onions on when you serve this. Hope that helps! You can add heaps of umami to this dish by adding a tablespoon or two of Marmite. Try it! Wonderful info! I noticed that many Japanese recipes use mirin or sake. I am Buddhist, so I can't use alcohol. Do you have any suggestions how to substitute those? Hi, I have been meaning to write you, as I have many people click on the link to your recipe from my blog vegandietguy.com Nikujaga was one of my favorite Japanese foods before giving up meat 6 years ago, and recipes like this really help to make the transition to an all-plant diet. I hadn't prepared it for a while, but someone had given me sweet potatoes (which are more nutritional than white) and carrots, and I had some atsuage in the house. I made it without sake and substituted maple syrup with honey. While it was quite different from your recipe, it tasted great!